Using Tiptronic, the gears can be shifted up and down manually in an automatic gearbox. The gear that is currently selected will be maintained when the Tiptronic programme is selected. This remains the case until the system does not perform a gear change due to the current driving situation. Push the selector lever in position D/S to the right into the Tiptronic gate . Gently push the selector lever forwards ⊕ or back ㊀ to shift gear up or down . 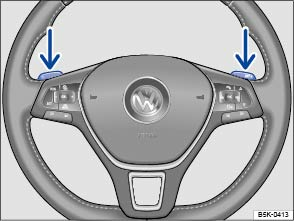 In driving mode D or S, or in the Tiptronic gate, use the paddles on the steering wheel (arrows). Pull the right paddle + towards the steering wheel to change up a gear. Pull the left paddle – towards the steering wheel to change down a gear. To leave Tiptronic mode, pull the right paddle + towards the steering wheel for approximately one second. 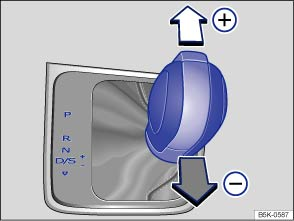 Tiptronic is automatically deactivated if the selector paddles are not operated for some time and the selector lever is not in the Tiptronic gate. When accelerating, the gearbox automatically shifts up to the next gear shortly before the maximum permitted engine speed is reached. When shifting down a gear manually, the gearbox will not change gear until the engine can no longer be overrevved.